Monrovia, Liberia: The President of the Republic, H. E. George Manneh Weah, has ordered members of his cabinet who are yet to declare their assets to do so in a week or face punitive action consistent with law. He said asset declaration under his regime will be enforced to the letter and there will be no sacred cows. The President gave the instruction Thursday, December 6, 2018, during a special cabinet meeting held at the C. Cecil Dennis Auditorium of the Ministry of Foreign Affairs also hosting the Liberian presidency. The LACC has reported that only 25% of members of the Executive have filed in their asset declaration. President Weah asserted that besides the fact that asset declaration adds transparency and accountability value to the government and makes the government responsible to citizens and the international community, it will be not an option left at the volition of officials, but a legal obligation that will come with penalties under the law. 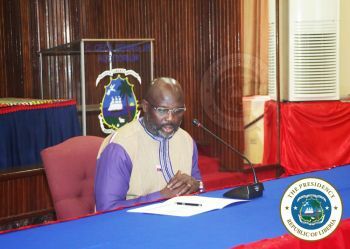 In another development, President Weah has also instructed all government ministries, agencies and commissions to submit their procurement plans to the Ministry of Finance and the Public Procurement and Concession Commission (PPCC) in the shortest possible time. He ordered that ministries or agencies failing to submit their procurement plan will be denied their allotments. He also reiterated his calls for members of his cabinet to be tax compliant, sending out the caveat that tax delinquent officials will be compelled into compliance. The President asked the Ministry of Finance and Development Planning, the Liberia Revenue Authority and other line ministries to devise means by which non-compliant officials’ salaries will be subjected to monthly deduction. The President and his cabinet used the meeting to discuss many other important national issues and strategies to make the Pro-Poor Agenda for Prosperity and Development work to achieve its objectives and targeted deliverables. The Cabinet, amongst other things, agreed to embark upon a national address system which will capture and locate every building or structure with their specific details within the borders of Liberia. To this effort, the President constituted a special committee to develop a framework for the national address system and report subsequently to the Cabinet. Members of the special committee include the Post and Telecommunications Ministry, Liberia Revenue Authority, the Liberia Institute of Statistics and Geo-Information Services, and the Liberia Electricity Corporation. Other members include PPCC Director Dorbor Jallah and GSA Director General Mary Broh. The Commissioner-General of LRA, Thomas Doe Nah and LACC’s James Verdier made separate presentations on the states and implications of government officials’ compliance in tax payment and asset declarations respectively. Both men also provided clarifications and enlightenments on their respective programs and policies. Youth and Sports Minister Zogar Wilson also used the meeting to rally his colleagues who he said represent various counties to provide moral and other necessary support to the National Sports Meet which opens Sunday, 16 December in Sanniquellie, Nimba County.